Pompano, bluefish, jacks, whiting, croaker, blue runners, ladyfish, and sharks all provided some great surf fishing activity over the weekend. I fished at Middle Cove both Saturday and Sunday with my family and that beach certainly did not disappoint. 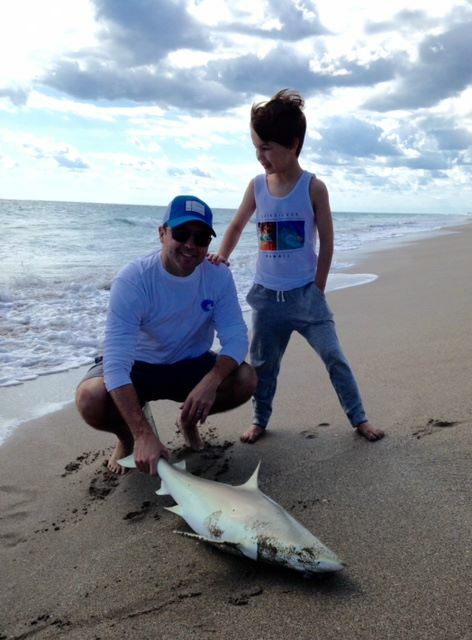 My grandson Christian, and son Danny each recorded firsts as Danny landed a shark on a fillet of a fresh caught bluefish and Christian caught his first pompano and bluefish from the sand. We also had fun with jacks, blue runners, and whiting and this is the springtime action in which everyone can participate. On Sunday the large pompano that are characteristic of this time of year were hitting clam strips and sandflea-scented Fishbites. I received a report late Saturday that Tiger Shores beach was red hot with large whiting and folks caught many fish during the day. Cut shrimp and Fishbites were the baits that my friends used to put together their catch. It's the time of year to fish a couple of long rods 60 - 100 yards off the beach for the Pompano. Don't overlook the first trough to target whiting and croaker with your light tackle - you'll have some fun and catch a great fish fry. Fish are being caught along the beaches from Fort Pierce to Hobe Sound, so pick a spot and bend a rod. Good luck this week and catch em up.